Mitragynine pseudoindoxyl is a rearrangement product of 7-hydroxymitragynine. It is an ananlgesic being more potent than morphine and about as potent as enkephalin. 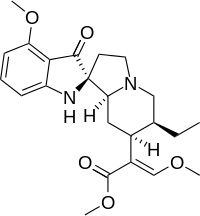 Mitragynine pseudoindoxyl is a μ opioid receptor agonist and δ opioid receptor antagonist and acts as a G-Protein biased agonist at μ opioid receptors and possesses a favourable side effect profile compared to conventional opioids. ↑ Jansen KL, Prast CJ (1988). "Ethnopharmacology of kratom and the Mitragyna alkaloids". J Ethnopharmacol. 23 (1): 115–9. doi:10.1016/0378-8741(88)90121-3. PMID 3419199. ↑ Takayama H, Ishikawa H, Kurihara M, Kitajima M, Aimi N, Ponglux D, Koyama F, Matsumoto K, Moriyama T, Yamamoto LT, Watanabe K, Murayama T, Horie S (April 2002). "Studies on the synthesis and opioid agonistic activities of mitragynine-related indole alkaloids: discovery of opioid agonists structurally different from other opioid ligands". J. Med. Chem. 45 (9): 1949–56. doi:10.1021/jm010576e. PMID 11960505. ↑ Yamamoto, L. T.; Horie, S.; Takayama, H.; Aimi, N.; Sakai, S.; Yano, S.; Shan, J.; Pang, P. K.; Ponglux, D.; Watanabe, K. (1999). "Opioid receptor agonistic characteristics of mitragynine pseudoindoxyl in comparison with mitragynine derived from Thai medicinal plant Mitragyna speciosa". General pharmacology. 33 (1): 73–81. doi:10.1016/S0306-3623(98)00265-1. PMID 10428019. ↑ Váradi A, Marrone GF, Palmer TC, Narayan A, Szabó MR, Le Rouzic V, Grinnell SG, Subrath JJ, Warner E, Kalra S, Hunkele A, Pagirsky J, Eans SO, Medina JM, Xu J, Pan YX, Borics A, Pasternak GW, McLaughlin JP, Majumdar S (2016). "Mitragynine/Corynantheidine Pseudoindoxyls As Opioid Analgesics with Mu Agonism and Delta Antagonism, Which Do Not Recruit β-Arrestin-2". J. Med. Chem. 59 (18): 8381–97. doi:10.1021/acs.jmedchem.6b00748. PMID 27556704.